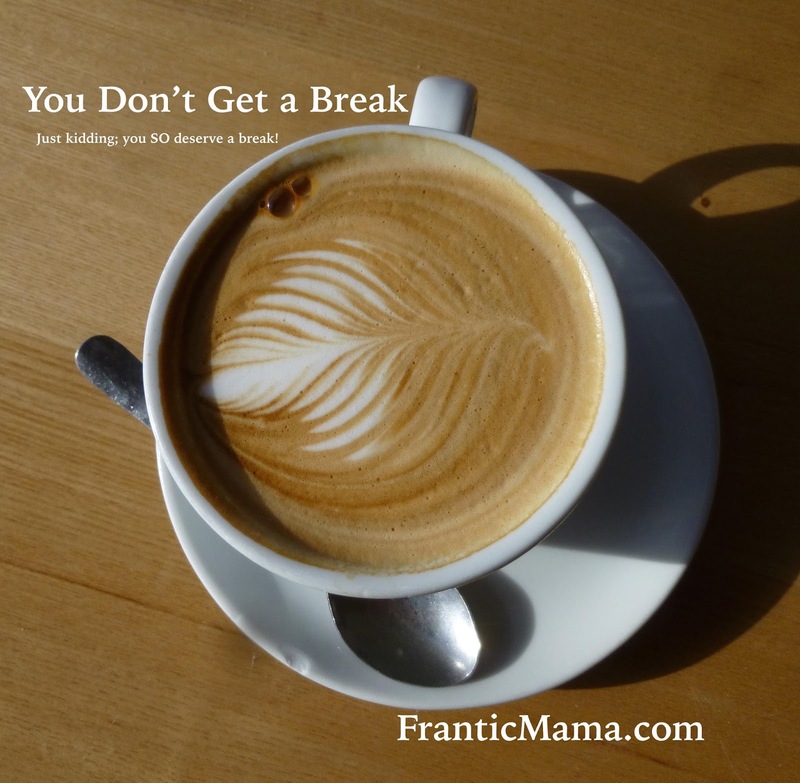 Frantic Mama: "You don't get a break." It was 5 years ago, and I still remember it. Alone, without my newborn son in tow for one of the first times, I stopped by the coffee shop near our apartment. The barista, who had seen me frequently that summer, as it was one of the only places I was brave enough to visit with my new baby, called out as she saw me at the register, "Where's the babe?" "Oh, he's home with my husband. I'm getting a little break, I guess," I stumbled, inexplicably feeling embarrassed by my new-found, short-lived independence. "Break?! You don't get a break!" she exclaimed loudly, not without some humor in her tone. Startled, I couldn't come up with a response, so I forced a chuckle, grabbed my drink, and instead of sitting peacefully at a table as I had planned, I hurried out the door. Surely the barista wasn't trying to embarrass or hurt me. As far as she was concerned, she was engaging in friendly banter with a regular customer. However, to a sensitive, tired new mother, her words made me want to run and hide. Maybe it is absurd that I need a break, I worried. 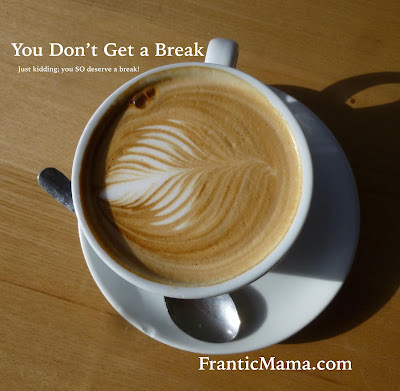 Maybe other moms don't need breaks from their babies. Now, five years later, just when that very baby is starting kindergarten, I get angry inside thinking of that fleeting, seemingly inconsequential moment from my past. Of course I deserved a break! Of course I had the right to enjoy a latte by myself for a few minutes while my husband held our baby! So here's my pay-it-forward to all the new parents out there. You DO deserve it. You 100% deserve it. Don't let anyone make you feel badly about taking care of yourself. Don't listen to that inner guilt-- far too easy to let fester-- when you are at Target by yourself for the first time in days/weeks/months and a friend with her 3 kids teases you for your "luxury" of being alone. Don't let your mother-in-law's warning that 'you'll miss every second of the baby years' sink in too deeply when you are feeling overwhelmed. Don't let yourself drown in the all-encompassing responsibility of parenthood. For me, Motherhood is like a gerbil wheel that never stops turning completely, so you need to take time for yourself in order to keep going. We simply must take care of our souls in order to care for our families, and this means breaks. Breaks from being responsible for anyone but ourselves. As far as the barista who cajoled me that day, I have no ill will for her, but I do resent the underlying implications of her words. I did darn well deserve a break that day, and I didn't need someone to make me feel any more guilty than I surely already did. Words matter. I love and strive to live by J.M. Barre's (creator of Peter Pan) quote, "always be a little kinder than necessary," because you never know how much your words might impact someone else. *hugs* Julia, and this is a perfect, much needed post. I passionately hate the "you'll miss it, enjoy every second" comments. Yes, I know and I do - I already miss his early years - but to gloss over how difficult it can be in the moment is a disservice to parents. Thank you, Dakota! I also "passionately hate" the 'relish every second' warnings-- just too much pressure! I agree-- I also feel a tender, bittersweet feeling about the baby years, but that doesn't take away the huge changes and challenges those years bring.
" Once you have lived with the mountains,under the benedictory pines and deodars, near stars and a brighter moon...you will return,you will come back to touch the trees and grass,to once again climb the windswept mountain pass"
We do go back every year. It holds us together.This year we couldn't and now that the himalayan wind is starting to blow and the sunlight is changing, I burst into tears the other day. My eight year old came up to say," hey mamma,I understand"
It felt good . It hurt. And it healed me inside. You are so right Julia,about kindness.I only wish that grownups could be so free with it like only children can be.Support without expecting returns.There would be so much less contempt. How sweet that your son seemed to understand you. That is a gift! He must be sensitive then? I'm sorry to hear you don't have anyone to help watch them from time to time so you can have a break and come back refreshed. Do people hire babysitters where you are? That has been my saving grace! It is always hard to relax when my kids are with someone else, but it is usually worth it because I come home excited to be their ever-so-active mother! Support without expecting returns...yes, it is a rare thing indeed! Thank you for reading and sharing :).